Move over March Madness, March is the time for Makeover Madness with Mary Kay Makeover Day on Saturday, March 8th! Nearly 1,000 women were asked why they get a makeover and guess what the number one reason was??? “Just Because“!! LOVE IT! With Mary Kay Makeover Day fast approaching, there has never been a better time to celebrate International Women’s Day by having a little fun with color. Apply Mary Kay® Mineral Eye Color in Hazelnut to the creases and on the eyelids. Layer on Moonstone, taking it up to the brows. Apply Sparkling White as a pop of color in the middle of the eyelids. Line upper and lower lash lines with Mary Kay® Deep Brown Eyeliner. Apply Mary Kay® Lash Love® Lengthening™ Mascara in I ♥ black. Define brows with Mary Kay® Brow Definer Pencil in Brunette or Mineral Eye Color in Espresso. Brush on Mary Kay® Mineral Cheek Color in Shy Blush. Apply Mary Kay® Creme Lipstick in Red. Blot, then reapply at the center of the lips. To find a local makeover event, women can simply click here for COLOR! Ok!! Now onto the contest!! One winner will walk away with the Mary Kay Makeover Day prize pack. Retails for $180. Mary Kay® Lash Love® Lengthening™ Mascara in black. The delicate details that I liked the most were the eyeshadow tips. I like that a Sparkling White was added as a pop of color in the middle of the eyelids. Sounds pretty! #1 Applying eye mineral makeup. I really enjoyed tip 1: Apply Mary Kay® Mineral Eye Color in Hazelnut to the creases and on the eyelids. Layer on Moonstone, taking it up to the brows. Apply Sparkling White as a pop of color in the middle of the eyelids. Eyeshadow application can make a world of difference in the way you look. Brightening up your eyes seems to brighten a person’s face completely. I love creative eye shadowing techniques as well. I like the tip to use brown mascara because Im always using black. I wish for long lashes! Apply Sparkling White as a pop of color in the middle of the eyelids. My favorite tip was to line upper and lower lash lines with Mary Kay Deep Brown Eyeliner. Never used a brow definer. I think this trend is a good one. I like the eye colors tip! I liked Apply Mary Kay® Lash Love® Lengthening™ Mascara in I ♥ black. I always apply my eye color incorrectly. Good tip! I liked the tip on applying eyeshadow. it was good information on where to apply each shade and how to blend for the best effect. I like the first tip, 1.Apply Mary Kay® Mineral Eye Color in Hazelnut to the creases and on the eyelids. Layer on Moonstone, taking it up to the brows. Apply Sparkling White as a pop of color in the middle of the eyelids. It’s nice to know how to correctly apply eye shadow. I like the Apply Mary Kay Creme Lipstick in Red. Blot, then reapply at the center of the lips. I will try this. I like the tip to try brown eyeliner vs black. My favorite tip was for the eyes. My favorite tip was to line the upper and lower lashes. # 6 Apply Mary Kay® Creme Lipstick in Red. Blot, then reapply at the center of the lips. 1.Apply Mary Kay® Mineral Eye Color in Hazelnut to the creases and on the eyelids. Layer on Moonstone, taking it up to the brows. Apply Sparkling White as a pop of color in the middle of the eyelids. I like 2 – Line upper and lower lash lines with Mary Kay® Deep Brown Eyeliner — so much better than the harshness of black. I love the tips on how to apply eyeshadow! I like the Eyes the most. I like the eye color tip. I like the tip Define brows with Mary Kay® Brow Definer Pencil in Brunette or Mineral Eye Color in Espresso. I liked this tip the best:2.Line upper and lower lash lines with Mary Kay® Deep Brown Eyeliner. MK has great products. I love #3 – You’ve gotta have that mascara to finish the look! i have no clue how to answer the question as i am a man..but my wife would really love this ,she is a big fan of the mineral make up and loves everything about it and has it all over our bathroom..she would be pleased to own this. My favorite tip is the first one about the eyeshadow. #3 was my favorite.. gotta love mascara.. I like Line upper and lower lash lines with Mary Kay® Deep Brown Eyeliner. I like the eye colors tip. No 5. Brush on Mary Kay® Mineral Cheek Color in Shy Blush. I like the eye shadow tips . I like #5: Brush on Mary Kay® Mineral Cheek Color in Shy Blush. Thanks! I learned about lipstick application and blotting. White in the middle of the eyelid? Never would have thought of that. The mascara! I think it would open my eyes more! I have never tried adding the light eye color to the middle or crease of the eyelid. Usually, I’ll add it to the front corner of my eye to brighten. I learned about defining the eyebrows. I like the tip about lining the upper and lower lash lines with Mary Kay Deep Brown Eyeliner. The tip for upper and lower lash lines. My favorite is #1 Apply Mary Kay® Mineral Eye Color in Hazelnut to the creases and on the eyelids. Layer on Moonstone, taking it up to the brows. Apply Sparkling White as a pop of color in the middle of the eyelids. I like the 1.Apply Mary Kay® Mineral Eye Color in Hazelnut to the creases and on the eyelids. Layer on Moonstone, taking it up to the brows. Apply Sparkling White as a pop of color in the middle of the eyelids tip. Thank you!! I never thought about blotting and reapplying lip color in the center – I’m going to have to try this. The mascara tip – I definitely have to have mascara as part of my makeup routine. this will be a good opportunity to learn how to do make up since i never put on make up before. I like the eye shadow tips. “Define brows with Mary Kay® Brow Definer Pencil in Brunette or Mineral Eye Color in Espresso.” Genius! Eye tips are always welcome! the eye color tips are the best! The mascara tip! I love a good mascara and would love to try it! I liked tip number 2- Line upper and lower lash lines with Mary Kay® Deep Brown Eyeliner. I like #6 – Apply Mary Kay® Creme Lipstick in Red. Blot, then reapply at the center of the lips. i think the eyes sound pretty- the image sheet does look soft and delicate! The eye show tips I cant figure it out on my own. I don’t wear much makeup, but the tip I like the best and I would use is Apply Mary Kay® Lash Love® Lengthening™ Mascara in I ♥ black. I’m still learning how to fix my brows, so this was great information! The eyeshadow tips are my favorite! The mascara tip, I have never been happy with my mascara. I like the eyeliner tips! Love the lipstick tips!! Never thought about reapplying in center of lips! I like Tip #1 the best. That has always been my most difficult task in applying makeup. I liked the eyeshadow tips, I hate to admit it but I am never really sure of how I should apply it, now I know. I like the tips about defining eyebrows. i liked the eyeshadow instructions- ive never put a lighter color in the center before, will have to try that. The cheek color would be a nice addition to my otherwise boring makeup routine. Apply Mary Kay Creme Lipstick in Red. Blot, then reapply at the center of the lips. I like #6 Apply Mary Kay® Creme Lipstick in Red. Blot, then reapply at the center of the lips. Lash Love Lengthening Mascara sounds like a dream, and I love the brow pencils, too! I like the one about applying lipstick, then blotting and applying again in the middle. I like the Lash Love Lengthening Mascara. Definition of eyebrows was most useful to me. I like Define brows with Mary Kay® Brow Definer Pencil in Brunette or Mineral Eye Color in Espresso. It makes a big difference to the overall look. i liked delicate detail number two the best. I like the eyeshadow tips. I like tip #5. Brush on Mary Kay® Mineral Cheek Color in Shy Blush. I like the first tip – Apply Mary Kay® Mineral Eye Color in Hazelnut to the creases and on the eyelids. Layer on Moonstone, taking it up to the brows. Apply Sparkling White as a pop of color in the middle of the eyelids. I love the tips for the eyes! Mary Kay has the best tips. I like this tip most: Apply Mary Kay® Creme Lipstick in Red. Blot, then reapply at the center of the lips. I’ve never tried that technique before, but will try it. I like this one: Apply Mary Kay® Creme Lipstick in Red. Blot, then reapply at the center of the lips. I enjoyed the tips about the eyes and brows because those are my problem areas. Apply Mary Kay® Mineral Eye Color in Hazelnut to the creases and on the eyelids. Layer on Moonstone, taking it up to the brows. Apply Sparkling White as a pop of color in the middle of the eyelids. This would really make your eyes pop! The time wise foundation is something I’d like to try’ thanks. I’ve been experimenting with white and love the effects! I need to define my brow. 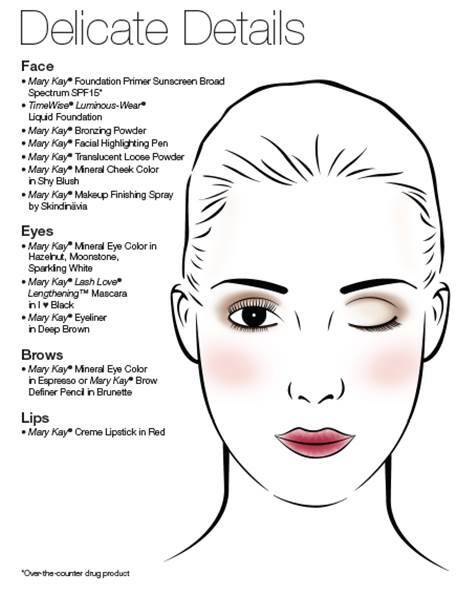 My favorite was #1.Apply Mary Kay® Mineral Eye Color in Hazelnut to the creases and on the eyelids. Layer on Moonstone, taking it up to the brows. Apply Sparkling White as a pop of color in the middle of the eyelids. I love the Mary Kay products. Thanks. TO apply the lipstick and then blot and apply again in the center. 3.Apply Mary Kay® Lash Love® Lengthening™ Mascara in I ♥ black is my favorite! I am at a lost right now ..because the last 4 mascara’s I bought from the drug store were big let downs. A friend told me about Mary Kay’s & I was thinking about ordering some next payday & then I saw this giveaway & almost did flips ! So excited! Apply lipstick, blot then apply again in the middle. I like the eye makeup tips – never tried white in the middle of eyelid for a “pop”! Makes sense, though! The finishing spray is my favorite.